Upon simply hearing the term “medical waste,” one might have several ideas of how this is defined by industry. 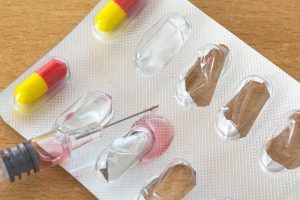 While some may not realize it, countless items and materials as seemingly insignificant as a band-aid can be considered medical waste, and depending on the industry, different healthcare providers and other facilities may deal with these myriad types of both common and uncommon waste more so than others. Unlike ordinary “waste”—or in other words, trash—which can be simply thrown away, medical waste is often hazardous and as a result, tightly regulated. Because of this, it is up to the hospitals, doctor’s offices, and other waste producers to ensure they have a safe and reliable system for disposing the medical waste they generate. Click on any of the titles in the table of contents to jump to a section you’re interested in learning more about, or simply scroll down to read this white paper in its entirety. How Should My Practice and Facilities Handle Medical Waste? So as you sit down to re-evaluate your medical waste disposal processes or plan how you will manage them for the first time, the question now becomes: How will you handle the medical waste your practice or facilities produce? Ranging from standard services like medical waste container pickup, to convenient and out-of-the-box disposal strategies like mailback systems, there are options to suit the needs of both massive healthcare providers and small facilities like funeral homes and veterinarians alike. Throughout this in-depth white paper, we provide a detailed breakdown of the top medical waste producers by industry—offering details that include waste types, specific laws and regulations, and even the most ideal containers and services for the various industries we serve. 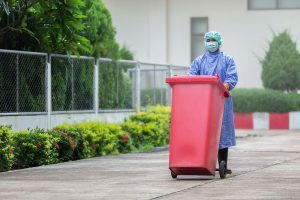 While large healthcare facilities like hospitals may immediately spring to mind, there are actually a variety of different industries that produce medical waste needing secure disposal. 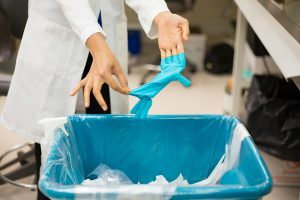 Although some, like doctors and dentists’ offices may seem incredibly similar, these industries produce specific types of medical waste at specific volumes—leaving the best medical waste disposal practices to also vary by industry. With the large volume of patients treated and procedures or tests done in hospitals and surgery centers, these industries must ensure the proper disposal of a variety of different medical wastes. General / Common Waste – Office paper, plastics, kitchen waste, or other nonhazardous waste. Pathological / Infectious Waste – Human fluid or tissue (blood, body parts, bodily fluids), and anything that might contain and potentially transmit bacterial, viral, or parasitic disease to humans (lab cultures, bandages, soiled sheets, etc.). Sharps – Needles, blades, knives, lancets, syringes, or anything else able to pierce skin or containers. Chemical / Radioactive Hazardous Waste – Laboratory reagent, disinfectants, film, unused liquid from radiotherapy, lab research, or contaminated glassware. Pharmaceutical Waste – Expired or outdated prescriptions, drugs, and chemicals. Much like the numerous types of medical waste generated by healthcare facilities and surgery centers, there are also many regulations to be aware of. Besides laws set forth by the Occupational Safety and Health Administration (OSHA) and the Department of Transportation (DOT) for disposal and transportation of waste, regulations like the Resource Conservation and Recovery Act (RCRA) also work to reduce the amount of waste generated and ensure disposal processes are safe. When it comes to medical waste containers, large healthcare facilities will usually need multiple, clearly-labeled and separated bins to accommodate the different types of waste they collect. It’s important to note normal trash cannot be mixed with medical waste, so it’s generally a good idea to keep these containers in a secure location away from trash. Facilities should keep sharps containers separate from regulated and common medical waste, and if anything does mingle with your waste, it should be treated as medical waste as well. Depending on whether you have a large or small amount of waste, you will need either bulk or non-bulk packaging respectively. Also, be sure your packaging meets either the United Nations’ bulk packaging requirements or DOT non-bulk container standards to ensure compliant waste disposal. Laboratories and blood banks handle infectious medical waste on a regular basis—requiring any items coming into contact with blood or regulated wastes in any other form to be properly sealed, disposed, transported, and finally destroyed. Facilities typically deal with two main types of medical waste—pathological human wastes and sharps. 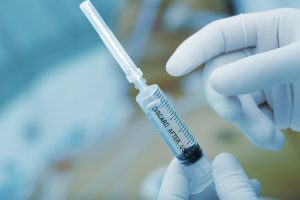 While contaminated sharps disposal is fairly standard from industry to industry, regulated waste for laboratories and blood banks is defined according to OSHA’s Bloodborne Pathogens Standard, 29 CFR 1910.1030. Pathological (Regulated) Waste – Liquid and semi-liquid blood or other potentially infectious materials (OPIM), according to the Bloodborne Pathogens Standard. Includes contaminated items that would release blood or OPIM if compressed, items caked in dried blood or OPIM, or pathological and microbiological wastes containing blood or OPIM. In addition to the Bloodborne Pathogens Standard’s definition of regulated medical waste, the Standard also gives specific definitions for regulated waste containers. This includes ensuring bins are labeled or color-coded, sealed prior to removal, and constructed to contain contents and prevent leakage at all times. Many states also have medical waste disposal regulations which must be considered in how to best manage your medical waste—here is a breakdown of waste disposal laws by state. Other than the daily volume of medical waste created by large healthcare facilities, doctor’s offices and veterinary clinics deal with a similar range of medical wastes. Human / Animal Pathological Waste – Includes any blood or OPIM. Microbiological materials or any other materials could be or are contaminated with infectious agents. Besides top federal regulations regarding the storage, disposal, and transportation of medical waste, there are also individual medical waste laws at the state level, which are a good idea to check out to ensure compliant waste disposal. 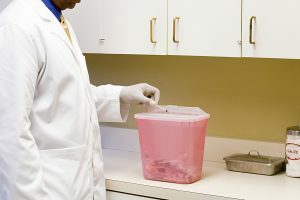 Given the different waste types generated at the offices of physicians and veterinarians, it’s a good idea to keep waste containers in secure area and to separate your sharps waste from other waste types. 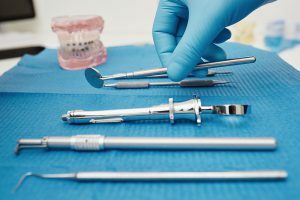 Although the specific type of work may vary slightly, a dentist’s office is likely to produce the same types of medical waste as doctor’s offices and surgery centers. Regulated Medical Waste – Red-Bag blood and other potentially infectious materials (OPIM) or human tissue. Hazardous Waste – Disinfectants, lead foil, amalgam, old crowns, X-ray processing chemicals, and more. Sharps – Needles, syringes, etc. Dentist’s offices will generate at least one type of medical waste, but because they may not have as much to dispose as frequently, they may store their medical wastes in mailback containers to simplify the disposal process. If the practice is busier than others, however, they may want to consider utilizing ordinary medical waste containers for pickup by a local waste disposal provider in the area instead. Similar to doctor’s offices, long-term care facilities and nursing homes have plenty of regulated medical wastes needing proper disposal. Since patients and residents of these facilities either live there or aren’t leaving for awhile though, this also means that there may be other wastes requiring management—such as pharmaceuticals. Regulated Medical Waste – Soiled sheets, blood, bandages, or other potentially infectious materials (OPIM). Pharmaceutical Waste – Disposal of expired or nonviable medications which can no longer be safely administered to residents or patients. Sharps – Used needles, syringes, etc. Many individuals at long-term care facilities require regular administration of medications, and because of this, national rules and regulations are in place to ensure the secure disposal of controlled substances and medications through mailback services, take-back events, and secured on-site waste containers. Facilities also have the option to take medications to retail pharmacies or doctor’s offices, however it is important that compliance is ensured by documenting all proper disposal through manifests. Funeral homes and their employees come into contact with deceased humans from a variety of places, meaning the funeral industry must regularly deal with medical waste ranging from blood and body parts, to medical devices, sharps, chemicals, pharmaceuticals, and even radioactive materials. Sharps – Incision needles, scalpels, scissors, cannulas. Regulated Medical Waste – Body parts, arterial tubes, swabs. dressings, and fabrics coming into contact with a body. Hazardous Waste – Formaldehyde, phenol, methanol, etc. Funeral homes have the potential to expose their employees to communicable and noncommunicable diseases, chemicals, bodily fluids, and other materials able to cause harm to themselves or the environment, which is why their applicable waste disposal laws and regulations are quite stringent. All items coming into contact with deceased bodies must be handled and disposed of properly—which includes using appropriate containers for sharps and other waste, as well as adhering to all state and federal medical waste regulations for disposal and transportation. Pharmacies are the main point of contact for the public when it comes to safely disposing of expired medications or used sharps, making it essential they have the equipment necessary for the safe disposal of medical wastes. Pharmaceutical Waste – Expired or unused controlled and noncontrolled medications requiring proper disposal. Sharps – Used syringes from pharmacies offering regular flu shots or other immunizations. In the pharmaceutical industry, laws like the Secure and Responsible Drug Disposal Act give customers the ability to bring in expired or unused medications so that they can be properly disposed of by the pharmacy. To provide this service, pharmacies have the option to provide DEA-approved containers for anonymous drop off, or standard pharmaceutical waste containers. Although the ins-and-outs of proper medical waste disposal can become complicated, Medical Waste Pros provides several waste disposal services like scheduled container pickup or mailback systems to make the process easy. When deciding which service would best suit your facilities, there are a few factors to keep in mind. First, take a good look at the total volume of waste you produce. Assuming you have only a few pounds or less, mailback systems designed for smaller amounts may be best—otherwise, consider container pickup for larger volumes. Afterwards, factor in how frequently you accumulate waste. If you run large facilities and need disposal regularly, then pre-scheduled services will save you both time and trouble. If you need disposal every once-in-awhile, you may want to opt for one-time pickup services. Given the size of large healthcare facilities like hospitals and surgery centers, there is likely little benefit to be gained from opting for mailback services. With the amount of medical waste produced on a daily basis, there would be countless mailings of waste to handle—making it far more efficient to dispose of all waste in one fell swoop using container pickup services. To ensure their patients get all the attention they deserve, the provider can even set up pre-scheduled pickup services for waste. When it comes to laboratories and blood banks, ideal disposal services can vary slightly depending on size and amount of waste generated by the facility. Assuming packaging meets mailback standards as well as the Bloodborne Pathogens Standard—which impacts these industries specifically—smaller practices can still utilize convenient mailback services. If, like a large healthcare facility, a lab produces regular and large amounts of waste however, container pickup will be the better bet. If your blood bank makes use of mailback services, try to use large containers if you are able to secure them during transport. Larger containers mean you will need to send in full containers less frequently—saving your facilities a large sum of money over time. 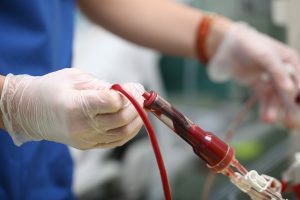 Like blood banks or labs, doctors and veterinarians’ offices usually can work with both container pickup services and mailback systems depending on the amount of medical waste they regularly produce. For a remote doctor’s office or veterinary clinics—which tend to generate less waste—mailback services are likely a more convenient and less-expensive route to take. In urban or even suburban offices where multiple physicians practice, there can be quite a bit of medical waste needing proper disposal, leaving container pickup as the ideal option. Regardless of whether you opt for mailback or pickup services, try to use bulk-packaging or large containers—assuming you can secure them. Larger containers mean you will need to send in full containers less frequently—saving your office or clinic money in the long-run. Based on the number of patients seen each day and the amount of medical wastes like sharps being produced, dental practices can work with either mailback or pickup disposal services. 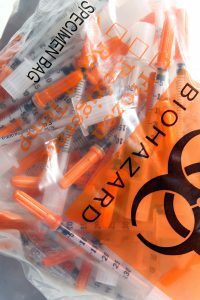 Although dentists’ offices will need separate medical waste containers for the countless used sharps they generate, like other waste containers these are available in various sizes. To help lower the costs of medical waste disposal, opt for larger containers and ensure they are completely filled before scheduling mailback or pickup services. While care is provided for residents when needed, nursing homes and other long-term care facilities typically do not generate much medical waste on their own. In terms of what waste they do need to securely dispose, it’s typically unused medications, sharps, and the occasional bandages. Because of the amount of waste they produce and the frequency they need disposal, these organizations benefit most from mailback services. While nursing homes and long-term care facilities generally don’t send in waste often, using large mailback containers will help to further reduce costs. Considering the number of different biohazards and other potentially infectious materials (OPIMs) that funeral homes and their employees are exposed to, disposal practices for this industry are highly regulated and require great care. For this reason, many funeral homes continue to use container pickup programs, as they produce a large volume of diverse waste which must be sorted and packaged separately. When deciding between mailback or container pickup services for a pharmacy, the question ultimately boils down to how busy they are. This industry mostly deals in disposing of expired medications—which can be easily shipped if it’s just a few bottles—but if the pharmacy also provides immunizations and disposes hundreds of bottles each month, a container pickup system could simplify the process. From local veterinary offices to massive hospitals and every blood bank or pharmacy in-between, the variety of different industries needing medical waste disposal services ranges far and wide. Which Services Will Best Suit Your Industry? – When evaluating medical waste disposal processes, start with the basics. Sure, one option may have perks over another, but what really matters is if it works for you. Consider your needs—do you have a large amount of waste or a little? These are the questions that guide you to the ideal choice. How Can Your Disposal System Be More Efficient? – As some might say, there’s always room for improvement—and your waste disposal system is no different. Whether you choose container pickups or mailback services, using the largest containers possible and waiting till they’re completely filled will lower your total service requests. Have Medical Waste Needing Disposal? Get Free, No-Obligation Quotes on Disposal Services! Although ideas of biohazard symbols and used syringes can quickly come to mind, medical waste actually encompasses things as small as a used bandage. Considering just how much medical waste there really is, it’s essential you ensure all your disposal bases are covered. At Medical Waste Pros, our nationwide network of reliable medical waste disposal providers are able to ensure you have all the resources and services you’ll need for securely disposing waste—including proper bins, mailback or pickup scheduling options, and more. To learn more about any of our available services or to get started scheduling with a medical waste disposal provider near you, just give us a call at (888) 755-6370, or simply fill out a form to the right to request free medical waste quotes today! Mailback System vs. Container Pickup—What’s the Difference? No matter the industry, if your facilities produce or deal with medical waste in any way, then it’s important that you have a plan for disposing it. Here, we provide a side-by-side comparison between two primary options for disposing waste—mailback systems and container pickup—providing you detail on the services as well as industry-specific insight to help determine which best suits you. What Are OPIMs and How Do I Deal With Them? In industries that specifically deal with blood or other regulated medical waste, OPIMs are going to be a major focus in your disposal processes. In this article, we break down OPIMs, offering detail on what they are, where they’re commonly found, as well as best practices for safely disposing of these other potentially infectious materials. Disposing of medical waste is a highly regulated and serious process that your practice or facilities should always consider carefully. Although there are steep fines for noncompliance, Medical Waste Pros can provide you with reliable providers near you. Here, we provide a final checklist of considerations for healthcare providers to ensure they choose the right services for their needs.